Download the 6 Benefits of Using Freelance Attorneys Instead of Hiring Associates to learn how to save time, make more money, and improve your life! 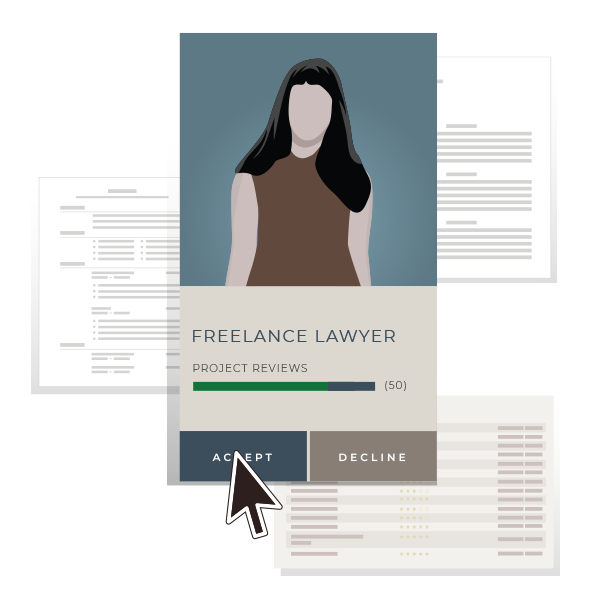 Build a team of freelance lawyers to work with on a regular basis. Quickly review resumes, writing samples and previous attorneys' reviews to hire exactly the skills you need. Our proprietary technology was built to comply with EVERY state's ethical rules. Compete with larger firms using our network of 1,000+ freelance lawyers in all 50 states. Get all of the benefits of a team of skilled associates without the overhead of full-time employees. Need a 20+ year employment lawyer? Need a lawyer who has done 25+ trials? Need a former judicial clerk to help with research? "After using LAWCLERK for the first time, our firm stopped using any other contract attorneys. LAWCLERK provides us unparalleled talent at rates that are friendly to the bottom line "
"Our firm has a bustling estate planning and probate practice. I have used LAWCLERK to hire freelancers to assist with research and drafting. LAWCLERK saved me so much time to focus on other tasks and the work product far exceeded my expectations." "I spend so much time out of the office and I find myself less and less able to spend time drafting documents that are above my paralegal's ability. LAWCLERK is the perfect solution." "As general counsel my job is to get the best work product I can get and lower my legal spend. LAWCLERK helped me do both. I have used LAWCLERK for a variety of projects including drafting commercial leases, CC&Rs and summaries of loan documents. I've been impressed with the years of experience and expertise of the freelance lawyers. This is a game changer for general counsel." "My experience with LAWCLERK has made me a believer. I hired a freelance lawyer to assist with a complicated U.S. Supreme Court Petition for Certiorari, and the result exceeded my expectations." We are the only online freelance marketplace built to comply with every state's ethical rules. Download our whitepaper and 50 state survey to see how we spent millions of dollars in development to protect you.